Kavourotrypes. 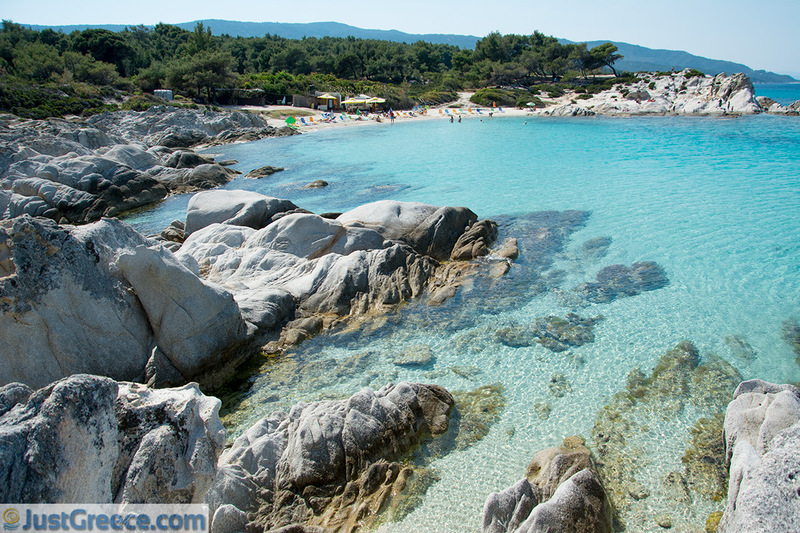 The beautiful beaches of Kavourotrypes are located in the east of the Sithonia Peninsula in Halkidiki. 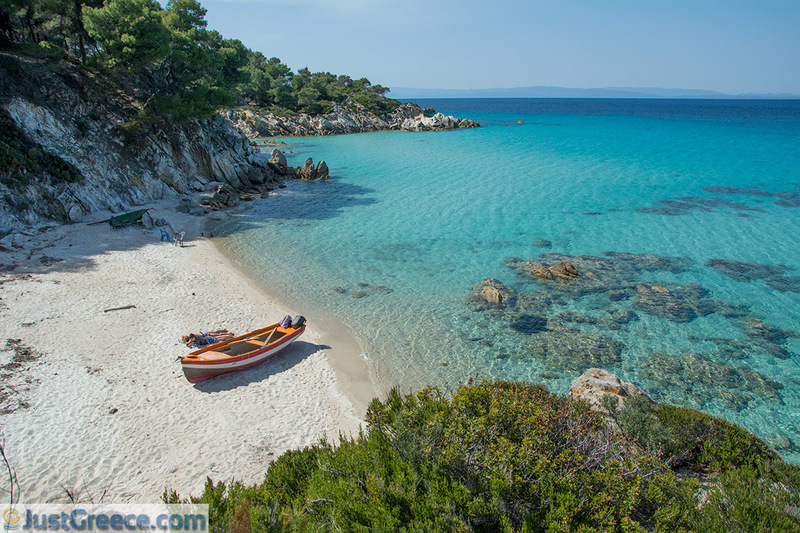 These beaches are considered to be the most beautiful of Halkidiki, maybe even the most beautiful beaches in all of Greece. 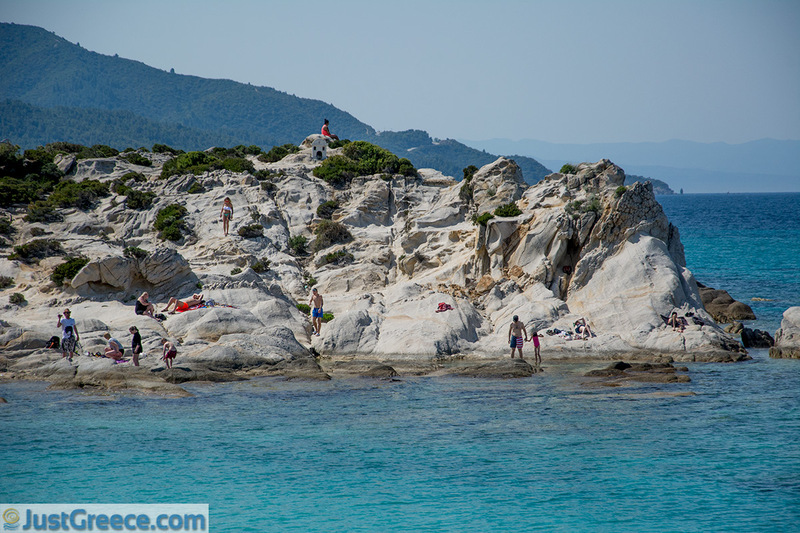 Kavourotrypes are several small sandy beaches in a rocky landscape surrounded by beautiful green hills with pine trees. 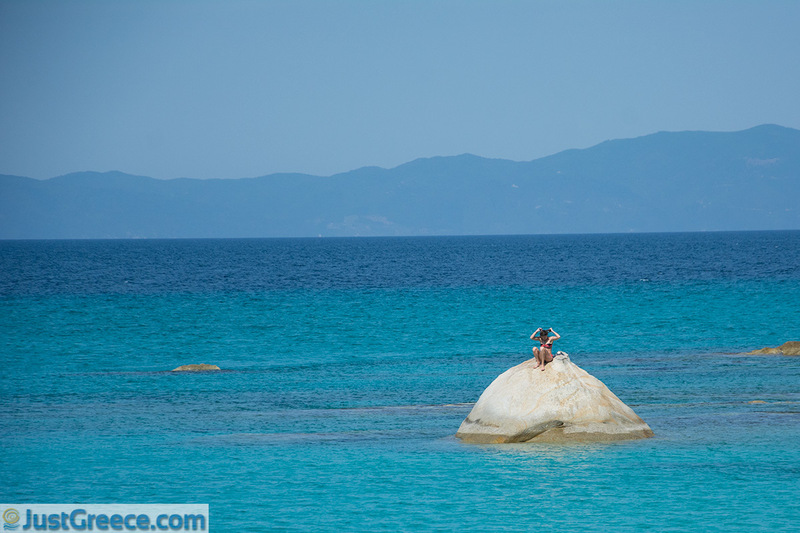 The turquoise coloured sea is beautiful to look at, to photograph from above and of course to swim in. The water is shallow here. 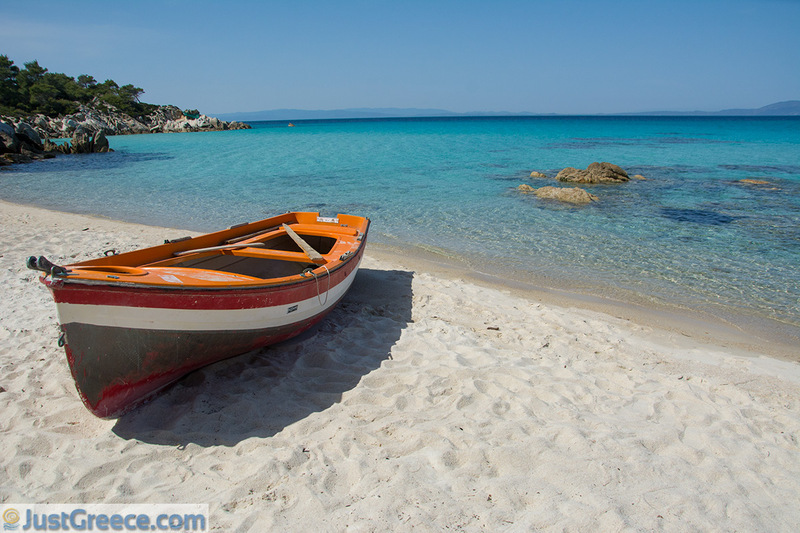 Kavourotrypes, also known as Portokali beach or Orange beach, is located about 22 kilometres southwest of Vourvourou and 6 kilometres north of Sarti. Coming from the north, two road signs appear with the names of Kavourotrypes and Portokali beach. A hundred metres before this, there is a kiosk (canteen). Behind the canteen, you can park the car in the pine forest. If you walk about 100 meters further you will get a breath-taking view. 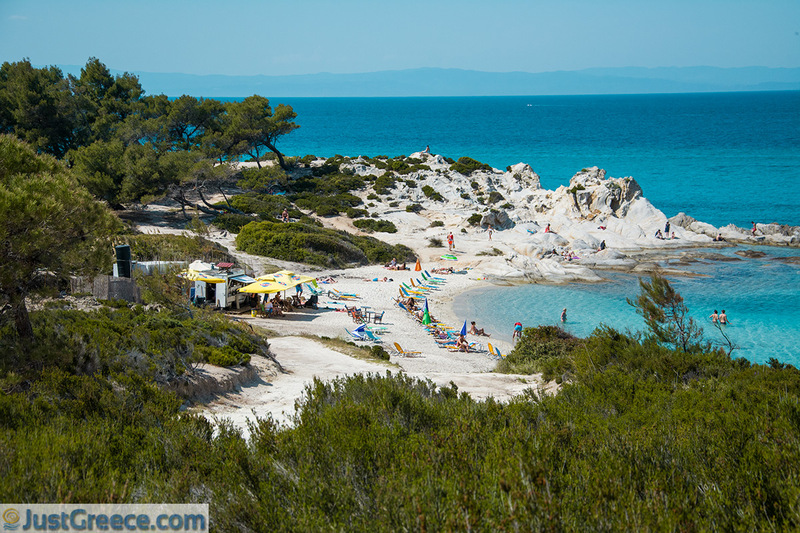 This small, sheltered beach is set in a beautiful little bay. 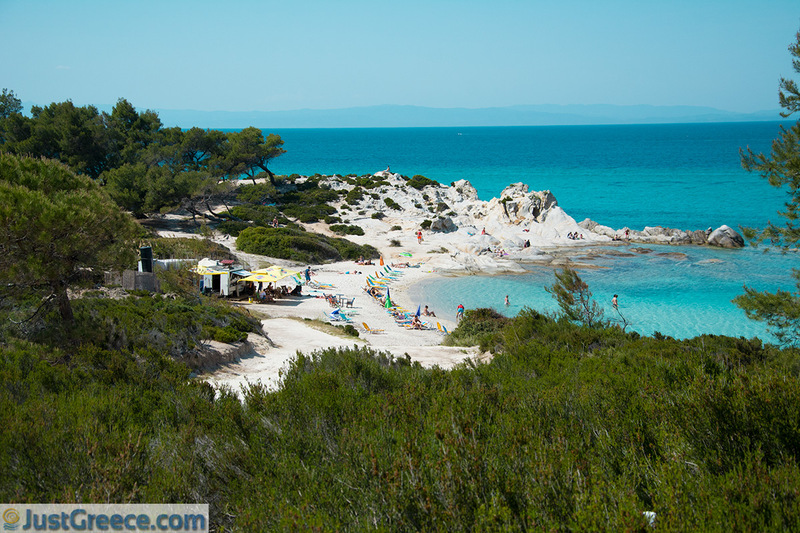 To walk down to this beach, you will have to walk on a path which is not too good but after some climbing and jumping, you will come to an extremely idyllic place. 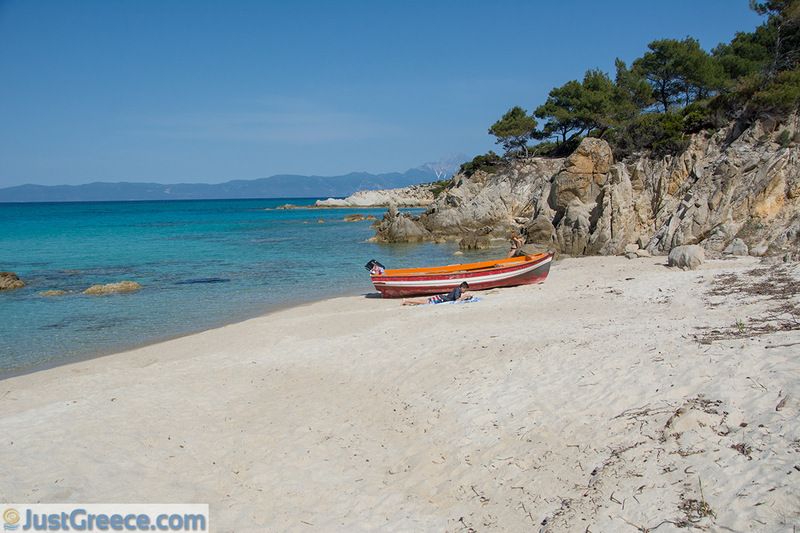 The moment that we were there, there was a rowing boat on the completely deserted beach, an amazing view. 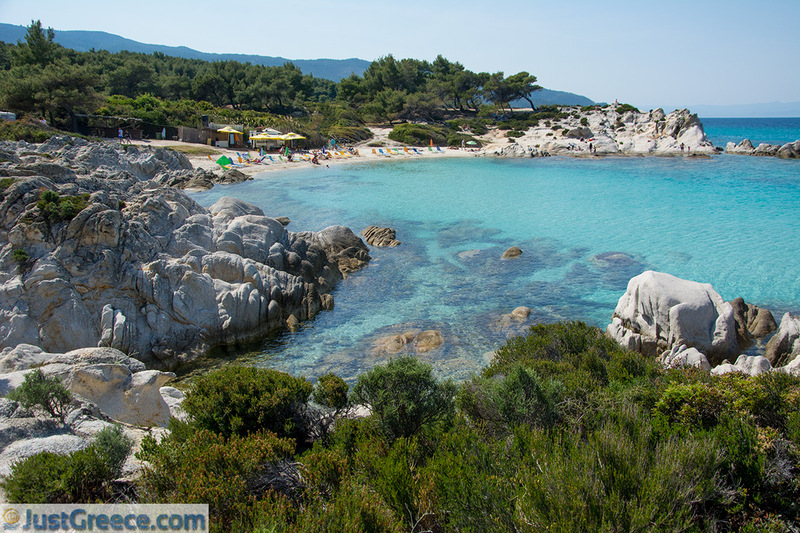 The other beaches of Kavourotrypes are a few hundred meters further on. You can park the car closer to these beaches by following the main road to where the road-signs stand and drive through the bumpy sand road, there after you will reach a place where you can leave your car. 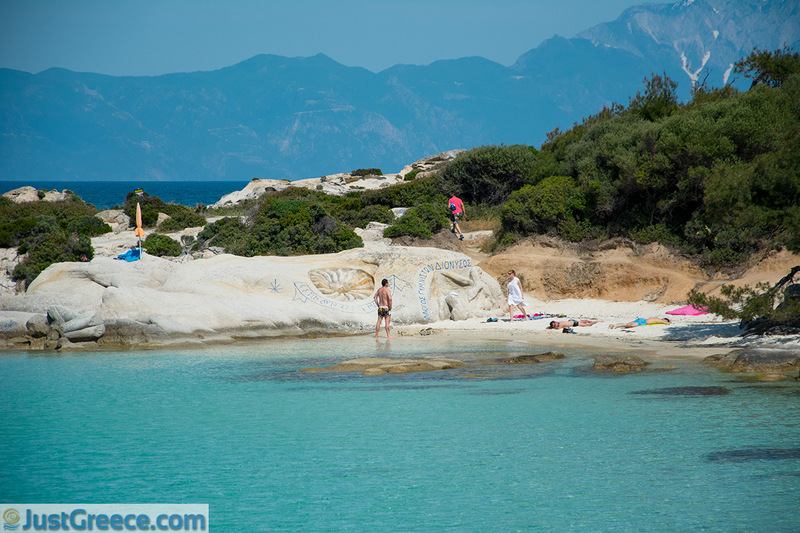 From here you will have to walk a hundred meters to the fantastic beaches in the small bays. One of these beaches has sunbeds and there is a beachside snack bar. The pine trees stand on the beach and the surroundings look like you are in the Bahamas or the Maldives. For a long time, Kavourotrypes has been a secret paradise for wildlife campers and nudists. Artistic people came on holiday here and made sculptures in the rocks. Thus, in 1997, a mermaid was made by Dionysios Karypidis and later Vergina's sun. The Vergina sun is still visible, however, the ‘petrified’ mermaid was destroyed by the maker himself because he was penalised from the Greek state for 'destroying the natural beauty'. Today however, this beach has been discovered by the masses. In the high season, it is very busy and there is hardly any place to lie on the beach. In the early and late season, however, it is a true paradise. We had a great time here in April and May (see pictures). 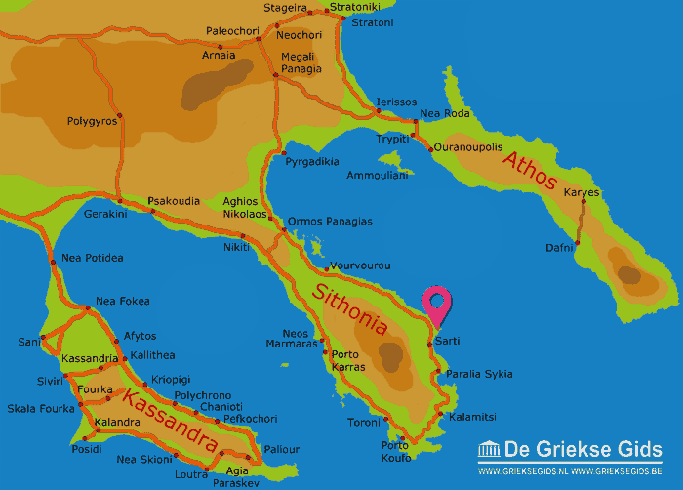 Halkidiki: Where on the map is Kavourotrypes located?